Burleson 4th of July 2018 Gold Star Pacesetters were once again a part of the annual 4th of July Parade in Burleson, TX. It was a fun warm day and the team did a great job of showing off the fun and fascinating sport to the crowd. Pictures by Malia Maureen Photography. Texfest Competition, Claredon, TX The Gold Star Pacesetters held/hosted a competition in Clarendon, TX this past June. Three of the team members attended this competition and clinic. It was a two day event in which the vaulters were part of a clinic on the first day and part of the competition the following day. Alejandra Oroca was the judge and clinician. 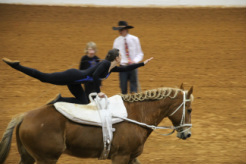 Adelee competed in the trot classes doing, trot compulsories and freestyle on the horse and the barrel. She also performed a Pas de Duex barrel routine with Alyssa. Alyssa and Carolina competed in the walk division doing the compulsories and freestyle on the horse and barrel. It was a great weekend and the girls learned a lot and did well. We are proud of the girls for working hard and helping to make this event a success. Emma Seely clinic in Albuquerque, NM,May 2018. One member of the Gold Star Pacesetters attended a clinic held in Albuquerque, NM in May of 2018. She had the opportunity to learn under Emma Seely, the U.S. Vaulting Team Chef d'Equipe. While there, she was able to learn new mounting, click and back swing techniques, as well as get to vault for 2 days with other higher level vaulters from another club. She brought what she learned back to Gold Star Pacesetters to help improve and teach other members and help them improve their skills as well.